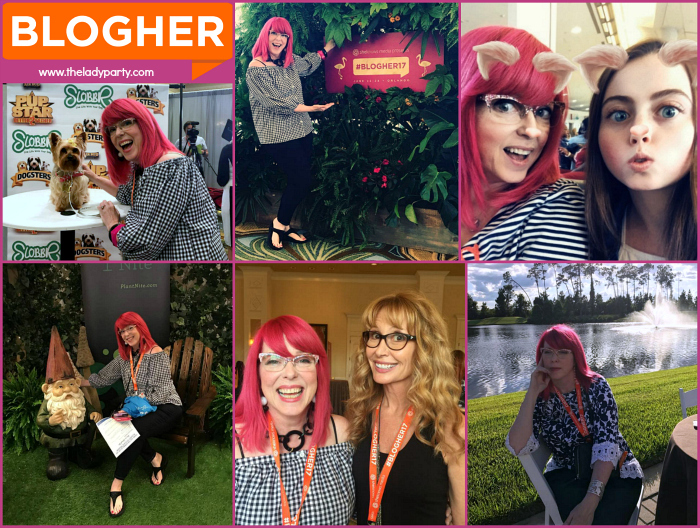 My daughter Avalon and I flew to Orlando last week to attend BlogHer17. I write for SheKnows Media. I've wanted to attend this event for years, but life intervened and the timing wasn't right. This year the stars aligned in such a way that I was able to make it happen, and by stars I mean the considerable help of my husband and mother. Thank you Drew and Mom! Here's the 411 on BlogHer if you're considering attending next year. I think it's well worth your consideration. The value you will get out of the speakers, sessions, and connections you make far exceeds the costs. The business contacts you can make in the sponsor lounge may potentially be huge for your platforms and brand. I regret not signing up for the event sooner for several reasons. First, signing up sooner would have meant a discounted rate on attending. Second, had I been able to book my room through the conference block, I would have saved money. (Side note: there was a special Welcome Basket for the people who booked at the partner hotel through the convention block. Since we booked after the block was sold out, we missed out on that perk. We were fine with that. We weren't there for swag, but it might have been nice.) Thirdly and most importantly, we were not able to attend any of the special events which were all filled on a first come/first serve basis. I was hoping to connect with AARP and their #disruptaging session. There was a waiting list for that event. Sad face. There's a lot to be said for being an early bird! * Be friendly, be assertive, be kind. So much of what you get from any conference is up to you. That person sitting next to you at lunch, or the random stranger on the elevator, just might be a possible new friend, cooperative colleague, sponsor, or business contact who could be invaluable. Don't be afraid to engage people in conversation, smile, offer them a seat next to you, ask them questions. Listen! If you're nervous, chances are you're not alone. You never know who you're meeting and what that might lead to for both of you. *If you have a chance to ask a question in a live session, do it. DO IT! I was the second person at the microphone in a breakout session on transformation. I put myself out there, explaining that I was looking for my over 40 tribe, and the response I got was overwhelming. I left with a stack of business cards from amazing women, and I made an impression. There are no stupid questions, but try to balance any 'shameless self promotion' with a valid, insightful, relevant, conversation worthy query. A quick sound bite about who you are and what you do followed by your url is plenty about you, make your comment/question a value add for everyone in the room. If people are interested in learning more about you, they'll ask for a card or visit your site. Don't skip breakfast or lunch. We made some great connections during the meals. We also saw some top tier speakers including Joy Reid, Serena Williams, John Avlon, Ana Navarro, Maria Bello, Carla Hall, Cat Cora, Keech Combe-Shetty...here's a full list. Sadly, we were not able to attend the opening events and keynote, so we missed Chelsea Clinton, Margaret Cho, Cecile Richards, and several other powerhouse speakers. Next year I will plan early so I don't miss a moment! I wanted to speak to a CEO of a company that I thought was a strong fit for my new book tour. I waited for an opportunity, respectfully approached her, gave her my very quick pitch and business card, and she was super receptive. If I hadn't taken that chance, I would have missed out on that connection. Kudos to my daughter for encouraging me! Lots of people were too busy on their phones to pay attention to the speakers and classes. It's rude and short sighted. Your phone will still be there during the breaks. Put the phone down, lift your gaze, open your ears, there's so much good stuff to absorb which you'll miss if you're staring at a screen, filming video, or taking selfies. Keep them simple and visually appealing. If you can spend a few extra dollars for thicker card stock, rounded corners, raised print, something that makes you stand out, do it. Make sure you include your social media links on your cards, I foolishly forgot and regretted it later. Derp. Each evening, I went through the cards I'd gathered that day and connected via social media with everyone I'd met. So much of the value in conventions is in connections, make them, plant them, harvest them later while your memory is fresh. I had my hair done right before I left. I wore comfortable, stylish clothing and accessories. I made sure everything coordinated, including my shoes and purse. When I go to craft conventions, I'm very over the top in terms of how I present myself, I dialed it back a little for this event. You want to stand out in a good way. Get a pedicure, a blow-out, some fresh clothing. Think about how what you wear is reflecting your brand, how do you want people to remember you? My hot pink hair was a huge conversation starter, I got compliments everywhere I went. I didn't wear a suit or high heels, but I did wear comfortable, chic, business casual attire. *Take pictures for social media! I didn't have a lot of time to post online, but I tried to take a great photo or two every day so my fans could get a little glimpse into the event. Had I been more prepared before I left, I'd have scheduled a Lady Party LIVE and done more video. Just remember to put the phone down and pay attention. A photo op or live video is great until it starts to horn into the experience of other attendees. Get your pics/videos quickly and move along so other attendees can get theirs. *Make time to see friends. I was so excited to meet Lorraine C. Ladish from Viva Fifty, we snapped a photo together in the collage above. I got some quality time in with the always inspiring and generous Kathy Cano-Murillo of Crafty Chica. I also ran into Jacque Gonzales, Jen Goode from 100 Directions, and Karen Poire-Brode from A Creative Approach Podcast. I am looking for sponsors for my book tour next spring. I asked companies if they'd be interested in partnering with me. I left the details open so we can talk further later. Most of the companies I approached were very enthusiastic, a few not so much. Not everyone is going to get what you're throwing down, and that's okay. Smile, thank them for their time, and carry on. Say thank you, to everyone who helps make the event possible. That means your waiter, the people at the admissions desk, the event facilitators, the speakers, the bartenders, the folks on panels, the sponsors. A little gratitude goes a long way. I cobbled things together at the last minute. This added unnecessary stress and costs to the equation. Had I planned, much of that stress would have been alleviated. Having a game plan for each day helps keep you focused and engaged. I got to every session early, which meant I got a good seat. A few sessions were SRO, having a seat was nice. *Take advantage of every opportunity, especially the ones that scare you. There was an open mic the second night of the conference. I'm not afraid to speak in public, so I went for it. I wish I'd been more prepared, because I had to go first and the post I read was maybe not the best fit for the crowd. I am proud of myself for tossing my hat in the ring anyway. Better to have tried and maybe not hit it out of the park, then to sit on the bench and wonder what might have happened. Next time, I'll be more prepared. I put my card in every bowl and did all of the extra things requested by sponsors. When I got home, I found out that I'd won a year of free hosting through BlueHost. (I signed up as an affiliate, so the link is affiliate based. Win-win!) I also got an upgrade and won 5000k free miles on my flight home. *Last, but surely not least, don't forget to have fun! You're on an adventure! Go to all of the meals, cocktail parties, and extra events. You paid for them! Enjoy the hotel amenities. All work and no play makes Jane a dull blogger. BlogHer18 is less than a year away...I can't wait! If you attended the conference and have more tips and takeaways, please leave them in the comments below. (Be sure to leave your url so we can connect!) Also, if you have any questions that I haven't answered above, I'm happy to answer them as best as I am able. Great post! What a wonderful event, one of the best. Loved seeing you and catching up! xo!!! It was so nice having time to connect. I've missed you! Thanks for your advice, I am taking it to heart. xoxo!